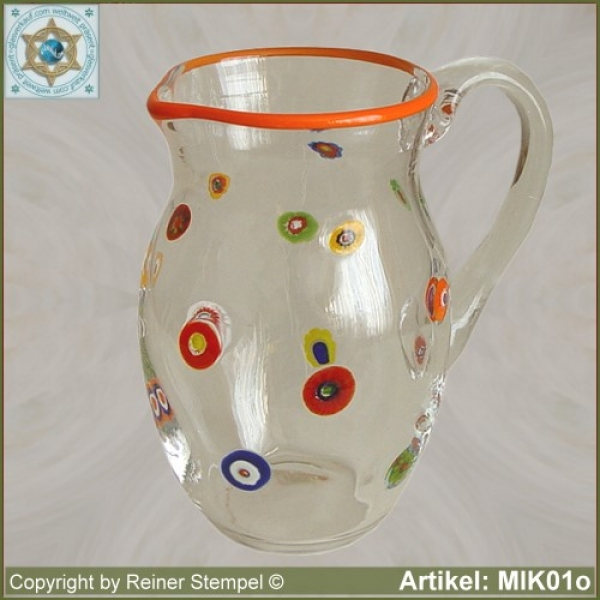 This glass pitcher is like all our products of glass a unique piece. This guaranteed the manual preparation and application with the so-called millefiori technique. 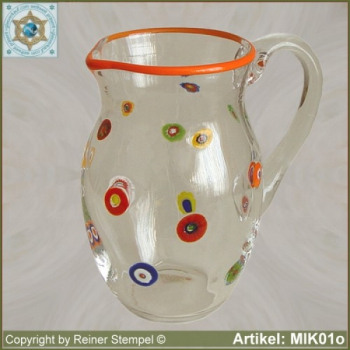 With this practical, colorful and attractive glass enrich your dining and living culture. From the liquid glass- melt, at approx 1150°C takes the glassmaker with the so-called glassmaker pipe, something glass. The term mille fiori comes from Italy and means 1,000 flowers, or the so called "thousand flowers- glass". The Millefiori glass pearls arise by artful compiled glass rods into a bundle. In hot state, the bundle will drawn to the desired length and diameter. The resulting glass rod will divided in small glass panes. The result is glass beads with flower design. These glass beads will given into the hot molten glass. Thus prepared, will the hot glass with the glassmaker-pipe through simultaneous forms and blow to an glass pitcher worked. Here, the millefiori beads are random distributed, and merge with the resulting glass structure to this unique pattern. Now, even the colored edge and the handle is incorporated. This glass articles are in front the glass furnace freehand - so without form - blown. Therefore one speaks of free-form glass. Then must the glass pitcher in the so-called cooling oven and shall at 520°C overnight cooled slowly to room temperature. This is necessary to compensate for material stresses. High manual skills, a good sense of proportion and years of experience with the glass material are the basic prerequisite for the production of our high-quality glass articles. Unbreakable packaging send we our high-quality glass ware to our customers around the world.